Words can stir the soul when they come from the heart. 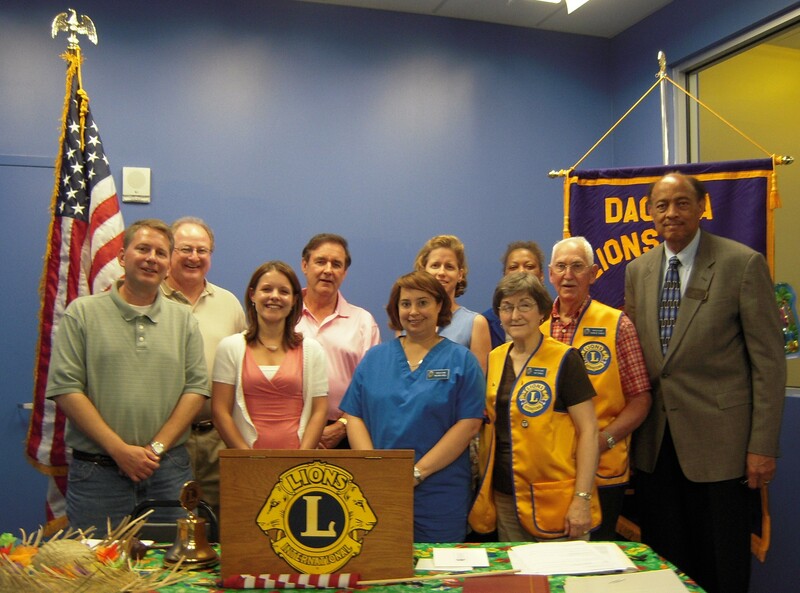 The Dacula Lions Club was informed and inspired last week by a visit from Angie Jinright and Bill Russell. They joined us to discuss the journey of three year old Jackson Jinright and his struggle with Peroxisomal Disorder, a rare congenital affliction caused by the absence of cell components. While a cure is currently lacking, it was clear that there was not a lack of Faith or Determination by Jackson’s mother, Angie Jinright, or Jackson’s grandfather, Bill Russell. It was evident that the quest for a cure and enhanced quality of life for Jackson is a constant goal for Jackson’s entire family. Every six months, the family travels to Barcelona, Spain in order for Jackson to receive treatment from Dr. Manuela Martinez and the staff at The Manuela Martinez Foundation for Children with Metabolic Diseases. The treatments consist of a fatty-acid DHA dietary supplement to aid development, combined with intense therapy. The treatments to not act as a cure, but do assist in weight gain and a general improvement in health. In between treatments in Spain, Jackson is immersed by the love of his family and various occupational, physical and speech therapies back in Georgia. Jackson’s family takes great care to increase his quality of life, while keeping a firm eye towards finding a cure. They have tirelessly to raise funds for a cure and their efforts have been an inspiration to many – including myself. So while the poem Welcome to Holland was written by Emily Perl Kingsley, and describes the journey that many parents relate to as they reflect on the beginning of a journey of caring for a child with a disability, it was our guests that caused everyone’s soul to stir at the meeting. I salute Angie Jinright, Bill Russell and everyone else in the world that makes “Holland” a much better place. I am often asked to describe the experience of raising a child with a disability to try to help people understand it, to imagine how it would feel. Its like this. When you are going to have a baby, its like planning a fabulous vacation trip to Italy. You buy a bunch of guidebooks and make wonderful plans. The Coliseum. The Michaelangelo David. The gondolas in Venice. You may learn some handy phrases in Italian. Its all very exciting. After months of eager anticipation, the day finally arrives. You pack your bags and off you go. Several hours later, the plane lands. The stewardess comes in and says, Welcome to Holland. HOLLAND?! you say. What do you mean, Holland? I signed up for Italy! I’m supposed to be in Italy. All my life I’ve dreamed of going to Italy. But there’s been a change in the flight plan. They’ve land in Holland and there you must stay. Its just a different place. Its slower-paced than Italy, less flashy than Italy. But, after you’ve been there for a while you catch your breath, you look around, and you begin to notice that Holland has windmills. Holland has tulips. Holland even has Rembrandts. But everyone you know is busy coming and going from Italy, and they’re all bragging about what a wonderful time they had there. And for the rest of your life, you will say, Yes, thats where I was supposed to go. That’s what I had planned. But if you spend your life mourning the fact that you didn’t get to go to Italy, you may never be free to enjoy the very special, the very lovely things about Holland. Previous Post Still Wearing Your Green?